When I mentioned that I was interested in learning more about tea production, Pradip said he knew of a place I might be able to visit. 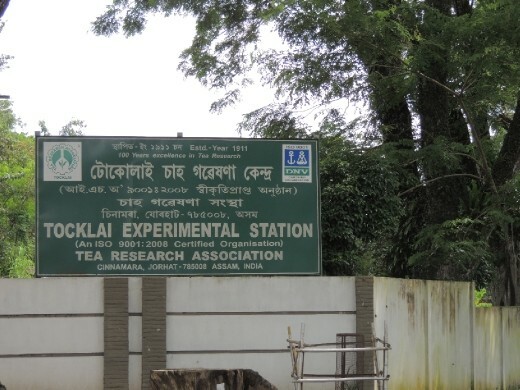 We arrived completely unannounced at Tocklai, the Tea Research Institute, and were graciously invited in. This is a site similar to independent U.S. research institutes although it is geared just towards tea and its by-products. Tea is crucial to India’s economy. Over 1.5 million people are employed in its production and distribution and if one includes the family members whose lives benefit from those who are working in the industry, it rises to 2% of the vast Indian population. It is the leading export product for the country and clearly an economic engine of local communities across the Northeast. In short, tea is very important to India and its population. This makes this particular Institute’s work critical to the establishment of production standards and for the creation of a sustainable series of products regardless of climatic changes. Tea came to India via China in the early 1800s by the British, and by 1896 Indian tea was cultivated in Calcutta. By 1906 wild tea was identified in Assam by Robert Bruce and by 1911 the Tea Research Institute was founded. Today there are a number of specialized labs, including but not limited to entomology, biochemistry, microbiology, genetics, and testing. They work hand in hand with field practitioners as it doesn’t help just to have results in the lab, but rather in the field. They have an active Tech Transfer division that is working on derivative products, including those for medical purposes. During my visit I learned that there are two kinds of tea in Assam, orthodox and CTC (Cutting, Tearing, and Curling). There four stages of preparation for CTC tea (which ends in tea grains rather than leaves): withering, rolling, fermentation and drying. They are working on standards for each of these stages based on temperature, time and density of the raw material on each of the machines for the stages. In the first of the withering vats, the open one, about 4-6 inches of leaves are added and kept there for 12 hours during which time about 70% of the moisture is extracted. From the open vat the leaves are sent to the closed vat for 14 hours, then the leaves are passed to another room via a series of bags on a conveyor belt. The bags are emptied onto a chute where a boy stuffs the leaves into a crusher. They go through the crusher twice before being sent to another conveyor belt, this one with three sets of rollers. Through the rolling process the green leaves are oxidized and change color to become more brown and copper. From rolling the product then goes to a flat belt with a couple of rotating blades, which both levels and aerates the tea. The last stage is the dryer. Right now they are using a Vibratory Fluidized Bed Dryer which vibrates the tea rather than having it touch metal, but they are experimenting with a new drying technique that is not unlike a microwave oven, and are testing radiation levels and the effects of that radiation on the tea. There is then a fiber extractor that separates out any sticks, veins or unwanted materials. The orthodox tea does not go through all these processes, as it does not cut and tear the leaves but does wither, roll and ferment them. The plants under investigation include both those developed from cuttings as well as from seed. They have developed 31 separate strains. When I asked which was better able to handle floods, I was told the cuttings seemed to do better as they had shorter shoots which wouldn’t be inundated for as long as the longer stemmed seeds. They have recently begun studying which kind of tea is better able to withstand flood conditions, and in what kinds of conditions might hybridization help increase sustainability. In the tea testing room, they evaluate the tea based on look, how much fiber there is and the color of the tea, smell and taste. A good tester can tell exactly from which tea farm the tea is from much the way a good vintner can tell where the grapes come from. They are not just researching tea for drinking at this Institute, but also for its applications for health care, so there are tea pills and powder as well as cookies that are part of the derivative products that are being developed here. The visit ended with a delightful cup of tea in a British drawing room of their guesthouse. It was a wonderful view into an excellent Research Institute that is interested in having international student interns working with them. They also have the facilities to house students, as the 50 or so senior researchers live on the Institute campus, which is laid out like a British garden. & I want to thank Drs. Nebnath and Barooah and their staff for their help and hospitality during my visit.